The Nassau Suffolk Water Commissioners Association (NSWCA) elects 2014 Board. Plainview, NY - Januray 8th, 2014 - At a recent Nassau Suffolk Water Commissioners Association (NSWCA) meeting sponsored by the Plainview Water District, the Association elected a new board for the 2014 term, which runs from January 1, 2014 through December 31, 2014. 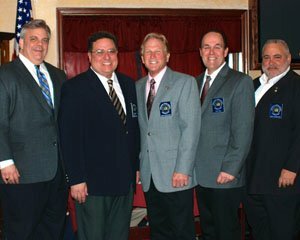 The newly elected 2014 board includes: President Howard Abbondondelo of Albertson Water District, 1st Vice President Thomas P. Hand of Massapequa Water District, 2nd Vice President Raymond J. Averna of Massapequa Water District, Treasurer and past President Karl Schweitzer of Hicksville Water District, and Secretary Andrew N. Bader of Plainview Water District. Organized and chartered in 1981, the Nassau Suffolk Water Commissioners Association (NSWCA) is comprised of water commissioners from 21 Nassau County and Suffolk County water districts. The NSWCA is dedicated to promoting environmental excellence and best practices as well as maintaining the highest standards of water quality and supply. The NSWCA sponsors regular educational meetings on topics that include the environment, security, economics, rules and regulations, among other related issues. For further information, please contact NSWCA President Howard Abbondondelo via phone, (516) 621-3610 or email awd11577@optonline.net. For more information regarding your district’s Water Commissioners, please call Agency Contact Jamie Stanco of Progressive Marketing Group, Inc. at 631-756-7160 or contact him via email, jpstanco@pmgstrategic.com. Pictured from left to right are Nassau Suffolk Water Commissioners Association’s 2014 board elects: 2nd Vice President Raymond J. Averna of Massapequa Water District, Secretary Andrew N. Bader of Plainview Water District, President Howard Abbondondelo of Albertson Water District, 1st Vice President Thomas P. Hand of Massapequa Water District, and Treasurer Karl Schweitzer of Hicksville Water District, who is also a past NSWCA President. Subject: LongIsland.com - Your Name sent you Article details of "Nassau Suffolk Water Commissioners Association Elects 2014 Board"